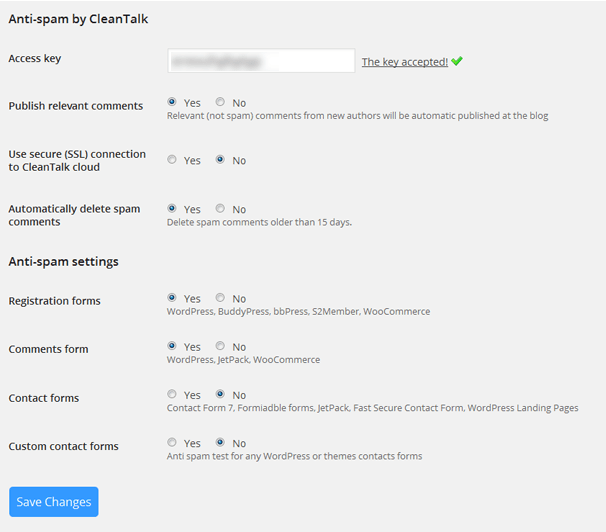 Home › WordPress › CleanTalk: Cloud-Based Anti-Spam Plugin for WordPress, More Effective than Akismet? 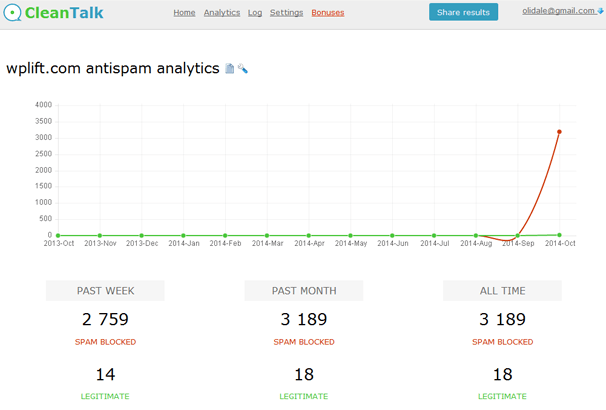 CleanTalk: Cloud-Based Anti-Spam Plugin for WordPress, More Effective than Akismet? 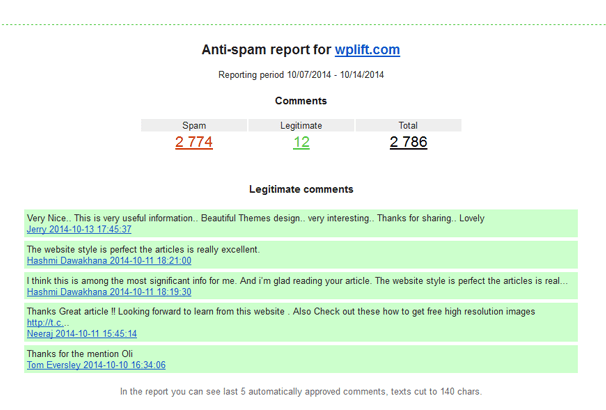 As you may know, spam became a big problem here on WPLift – I used to leave comments open on all articles and let Akismet handle the anti-spam but unfortunately this left me with over 4000 spammy comments that I had to delete manually, check out my post on the subject here. Since then I have been looking for better ways to handle spam and this has lead me to a service called CleanTalk which I have been testing out on the site over the last week or so and I have to say I am very impressed with the plugin. Stops spam bots contacts emails. WordPress, BuddyPress, bbPress, S2Member, WooCommerce registrations. Formidable forms, Contact form 7, JetPack Contact form, Fast Secure Contact form any themes/custom contact form. CleanTalk is a cloud-based service which has a free 14 day trial, after which the service costs just $8 per year – a bargain Im sure you will agree, but does it work ? Let’s take a look. Download and install the plugin as usual, then when you activate it you will need to head over to the CleanTalk website and register for an API key, once you have done that you can enter this on the plugin settings page and your free 14 day trial will begin. If you visit “Settings” > “CleanTalk” you will see some options for the plugin such as use SSL, automatically delete spam comments, where to use the service – registration forms, comments, forms, woocommerce etc. Now the plugin is installed and your have linked your API to your account on CleanTalk you are protected. The plugin emails you to let you know that it is now active on your site, you will also receive another email after your first week with a service report which details how many spam comments you were protected against, the number of legitimate comments and also a summary of the last 5 comments approved. If you would like some more detailed information, you can visit the site, login and click on “Analytics” to view a graph showing spam comments and legitimate comments. You can view the graph for WPLift here. 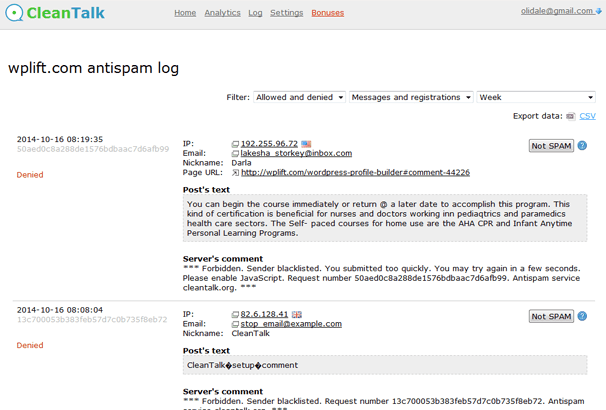 you can see, in the last week the plugin prevented over 3000 spam comments and let through 18 real comments. My favourite part of this plugin is you can then delve even further and look at “Logs” which will show the spam comments that were blocked and the reason for them being blocked. So it looks like they build up their own database of blocked IPs and blocked URLs plus the fact that bots will submit the form a lot quicker than real humans would. The plugin let through a couple of what I would call spammy comments, but these were of the type written by humans with things like “Great Post” and so on, these types of spam comments are the most difficult to prevent, otherwise the service was extremely effective – using on WPLift was a great test as we receive huge amounts of spam, even though I have disabled comments on posts older than 30 days. I like the fact that no Captchas are required – these are a real pain for site visitors and research shows they can put people off from using your service if they see one so I can see this plugin being great for sites using WooCommerce, I will be testing this out soon on my own site using it. With WooCommerce you have to leave user registrations open so people can order from you, which also leaves you open to spam bots registering, this plugin should solve that. If you are finding Akismet and other spam solutions are not working as well as you would like then I highly recommend testing this out on your site – with a free 14 day trial you should be able to get a feel if it works for you, and the $8 per year fee seems extremely good value for me. ‹ Even more opportunities to provide protection from spam in WordPress.